La Marsa. © Hela Ammar. ‘For each person to earnestly cherish their rights is the essence of civil society’. Ai Weiwei, 6 April 201o. A perennial issue has re-emerged in discussions of contemporary art practices in the Middle East and North Africa: what is the relationship of art to politics; or, similarly, what is the relationship of artistic practice to forms of activism and revolutionary conflict? There is a degree of inevitability to these questions: in times of conflict and upheaval, nowhere more so than during and after the so-called ‘Arab Spring’, artists are called upon to represent both the immediacy of conflict and its aftermath. If artists are going to respond to these issues, and who is to say they should not (even if it does involve a degree of opportunism on behalf of artists, curators and institutions alike), we should be all the more alert to how the rhetoric of conflict and the spectacle of revolution is deployed as a benchmark for discussing if not predetermining the legitimacy of these practices. In creating a conceptual concordance between art as a form of activism – or in reducing art to revolutionary commentary – there is the attendant and far from submerged curatorial imperative that artists should react to the current socio-politics of the region if they are to be viewed as critically and institutionally relevant. It is an insidious demand that recalls the imperial assumption that the region can only ever be defined by forms of de-historicized conflict, atavistic strife and ideological extremism, with its culture relatable if not reducible to such events. Revolution, uprisings, the legacy of September 11 2001, internecine warfare, the ‘Arab Spring’, civil conflict, all have seen an intensification of interest in the region and its culture is, it would seem, expected to follow suit. There would again appear to be an ineluctable logic to these developments which means it is all the more crucial that we observe how the discursive and critical substantiation of conflict and the rhetorical ambivalences of revolution effects a subservience of the aesthetic to the spectacle of conflict, the claims and counter-claims of politics, the voracious demands of the market, and an unrelenting globalized media agenda. To rearticulate the relationship between artistic practices and art as activism (not to mention art and its apparent relationship to politics), whilst also addressing some of these concerns, we could consider the following: art as a practice, inasmuch as it is about what can be seen, said and heard in a given social order, is already political if we consider how it is an individual pursuit that is nevertheless a social event. Art as a practice implicates audiences, collaborators, institutions and critical discourse. In a process that can only ever evoke, and at times provoke, a sociopolitical dimension, art as a practice not only implicates but also complicates these relationships. To put it bluntly: art produces and is in turn produced by social relations. This is not about politically influenced forms of practice, nor art practices that assume positions in relation to an ideological or political issue (the latter being an all too easily identifiable and commodifiable practice); rather, this is about the ongoing role of creative practices in potentialities of social engagement and civic imaginations. Art and its institutions, that is to observe, are a fundamental part of civil society as we currently understand it and, in that event or moment, can recalibrate modes of social organization and interaction. This is not, to be clear, about art engaging in revolutionary practices or art as activism, or even art as a political stance: this is about the social formations and discursive irruptions produced by culture and its institutions. The extent to which visual culture has become a key site of antagonism for the forces of secularism and, for want of a better term, extremism – although both terms, as we shall see, elide a multiplicity of subject positions – is all the more notable when it comes to considering what is understood by public and private space in cities across North Africa and the Middle East today. Who, crucially, gets to determine the relationship between the public and private. It is the terms of this relationship that underwrites a fundamental ambition of civil society and pre-defines how it operates as an ameliorative between private morals and public mores. In what follows, and to the extent that I will provisionally promote art and its institutions as an indelible part of civil society, I will nevertheless observe a number of caveats. Firstly, to suggest that art as a practice and the institutions it supports, and is in turn supported by, should somehow add to a common good or the goal of civil society is to entertain that most cherished of neoliberal, state-sponsored ideals: the instrumentalization of culture so that it answers to political priorities. This would be misguided and elides a fundamental point: the practice of art, as noted, can only ever engage the social sphere and in so doing promote, for better or worse, debate and dialogue about the nature of that relationship. The instrumentalization of art practices – for whatever institutional, critical or curatorial ends – comes after that fact. Secondly, whilst advocating art and its institutions as a key factor in the development of civil society across North Africa and the Middle East, it is crucial that we consider how such practices can both support and equally question the parameters and effectiveness of civil society in countries where it has been largely notable by its absence and, in some cases, widespread proscription. If we are to fully explore how culture can contribute to a common good that is not simply a function of the state, the outcome of religious edict, or the self-serving logic of the market, we also need, finally, to explore what exactly is meant by civil society across North Africa and the Middle East and how this term is understood in the context of cities that have a majority Muslim population. In its proposition of a collective, mutually-engaging and shared sense of the social sphere that works in the name of a common societal good (and, thereafter, for the common good of all and not the few), the term civil society increasingly indicates public activities that include but are not limited to political self-organization, community-based action, and collective expression through cultural events. One of the clearest ways to understand this relationship involves the acknowledgement of the manner in which art practices, which have always adopted an autonomous yet embedded role in social debates, are increasingly placed on the frontline of discussions about public and private space in, say, Tunisia or Egypt, and who has access to it, not to mention what can be seen, said and heard within the contiguous yet divided realms of such spaces. The use of terms such as ‘occupying’ and ‘constitution’ and, later in the same text, ‘resistance’ and ‘civil society’ placed it and the accompanying show firmly in the realm of the daily politics of Tunisia. It also placed it in the antagonistic realm of secular self-determination. Whatever the rights and wrongs of this situation, and it is evident that both sides of the argument have been strained to mean different things to different people, culture is a political battleground in post-revolutionary Tunisia. The debates it provokes about secular determinism, public space, the right to self-determination, debate and dialogue all go to the heart of what the Tunisian uprising was about in the first place: who gets to say what, where, to whom and why? Who, in sum, is subject to whom? And that, surely, is the most singularly political question we can ask today in any social order. Putting to one side Printemps des Arts‘s engagement with what are considered by many to be taboo subjects, the blurring here of private and public space, religious edict and secular determinism, and political opportunism and civil rights, makes way for a heady mix in what still remains a fraught and hard won freedom from despotism. In the days following the attacks on the exhibition, it was announced that the Palais Abdellia would be closed down as a cultural venue. On Tunisia 1 channel’s evening news programme, two days later, Noureddine El Khademi, the Minister of Religious Affairs, accused the artists of insulting Islam and called upon Tunisians to defend their religion. Following violence across a number of towns and cities, in the wake of such an incendiary call, dawn to dusk curfews were imposed. If a sense of what is at stake in the practices and institutional contexts of visual culture in Tunisia is needed, we need look no further than the less than helpful interjection by the Imam of the Zitouna mosque in Medina of Tunis, Houcine Laabidi, who explicitly called for the death of all artists involved in the exhibition. The tension between public and private, socially-responsible behaviour and the self-interest of the individual, private (perhaps religious) morals and public (perhaps secular) concerns, are precisely the tensions that civil society seeks to overcome and ameliorate in the name of a common, shared good. What becomes all the more evident, thereafter, is that for civil society to flourish in a given moment in time then public space, always a site of antagonistic forces, must be protected and access to it must be maintained for all. And herein lies a conundrum of sorts: if civil society produces a space for social organization, cultural expression, and collective action, freed from state-sponsorship and control then that space needs to be protected by political means and state-sponsored resolutions. We may want to pause here to enquire into the relationship between civil society, public space and art practices in countries where civil society has been largely absent as a social force. Civil society, in the broadest sense, is composed of voluntary social relationships, civic and social organizations, and other institutions that are relatively distinct from government and profit-led organizations or privately funded initiatives. For my purposes, civil society is also understood in terms of being a community-based and community-organized activity that is not undertaken by either government or commercial, for-profit businesses. In perhaps simplistic terms, civil society is therefore often contrasted with state control and is seen as a bulwark against the excesses of the state, religious edict, and the short-termism of market forces. The absence of civil society and its institutions is also understood to be indicative of an authoritarian state and it is notable that throughout the Middle East and North Africa the ascendancy of despotism was in part realized through the de-legitimization and marginalization of the institutions associated with civil society. Social Clubs, community organizations, men’s groups, women’s groups, non-governmental organizations, private voluntary organizations, sports groups, environmental activists, cultural groups, religious organizations, social enterprises, academe, activist groups, charities, support groups, trade unions, artist’s groups, art institutions, and community-based art projects – all form the bedrock of civil society, and all were often placed in precarious relationships to state and governmental control if not outright proscription across the Middle East and North Africa. If civil society is about anything, it is about autochthonous, indigenous growth that responds to a local or regional demand and the context of that locale. Civil society is, to be clear, the indigenous development of a space that reflects the social interactions and relations that exist within and give form to that space. A further example might offer more purchase here, again one from Tunisia. In March of 2011, a street-based artwork was conceived by a number of artists under the title Inside Out: Artocracy in Tunisia. 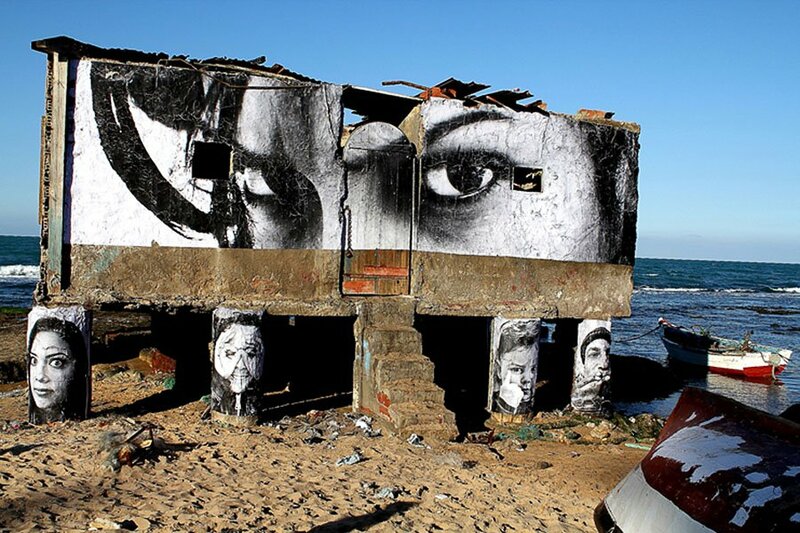 The event featured the portraits of one hundred Tunisians – deemed, for want of a better word, ‘ordinary’ – placed in prominent positions around the city of Le Kram, a town situated between the port of Tunis and Carthage. The images were positioned in places where portraits would have hung of the former (and by then disgraced) president, Zine El Abidine Ben Ali. One of the photographers involved, Marco Berrebi, was reported as saying that Artocracy was about giving people the freedom to debate the photographs and to come to their own conclusions. Implicit in the term ‘artocracy’ we find an interesting combination of aesthetic practice and democratic self-determination that is no doubt a key element in the project overall: the foregrounding of art as means to self-determination or, at least, a form of self-organization. In the project, moreover, we equally see an aesthetic gambit – the positioning of images in a public space – with a view to provoking debate. To paraphrase Meriem Bouderbala, quoted above, this is about occupying cultural territory and allowing access to it through images and symbols. However, interestingly, the first incarnation of this project, in the town of La Goulette, a suburb north of Tunis and not far from Le Kram, was met with a less than sympathetic response when local people angrily objected and the project was abandoned. Furthermore, posters pasted on the Porte de France in central Tunis were summarily torn down. The former project, despite government authorization (and therefore tacit support for the promotion of civil space and public debate), would appear to highlight the exact sensitivities surrounding the use of public space – who has the right to use it and who is barred from using it – that formed one of the key areas of outright protest in Tunisia in the early part of 2011. Such reactions also highlight that visual culture remains a potent topic for the population of Tunisia as a whole and not just so-called extremists. Whilst the Palais Abdellia affair was largely focused on the private space of an art institution (to which the public could enter), Inside Out: Artocracy in Tunisia was very much about public space in which a cultural project was staged. Public and private rub up against one another here in forceful and unpredictable ways and this is perhaps part of the problem with developing a civil society: the opposition between public morals and private beliefs is precisely what civil society sets out to accommodate but can only do if the space produced answers to a common good that benefits all. The common good must remain precisely that: common to all. What both events exposed is the manner in which artistic practices, in their indelible relationship to civil society, are firmly on the frontline of key constitutional and political debates, regardless of the subject matter being addressed in actual artworks or indeed practices. What Inside Out: Artocracy in Tunisia highlighted, intentionally or otherwise, was the fact that civil space and society cannot be controlled by culture – nor the state or the market for the matter – but remains a site of antagonistic and agonistic forces that do not necessarily yield to the liberal ideal of consensus. In the historical absence of civil society, its emergence can provide potential flashpoints even for those who actively support it as a welcome development for countries emerging from decades of despotism. Elsewhere, Dar Al-Ma’Mun, based in Marrakech, foregrounds questions of public space and civil society in their programme and institutional dialogues. Returning to Beirut, the art’s organization Zico House similarly promotes itself as a civil society organization for culture and development. And, in Iraq, the Ruya Foundation for Contemporary Art (RUYA), the official commissioners of the official Iraq Pavilion for the 55th Venice Biennale, likewise places prominent emphasis on creating ‘a network of intercultural events that can contribute to the development of civil society in Iraq’. This is admittedly a cursory overview of organizations who foreground the relationship between visual culture and civil society across the Middle East and we should note that the terms civil society and civil space are not necessarily being used as a counterpart to how they are understood in, say, Britain or France; nor is there the suggestion that civil society can be transposed to the region as a guarantor for the emergence and sustainability of public space for debate and disagreement. To suggest as much is of the same order of delusion that promotes western-style ‘democracy’ and consensus in the region as the only possible solution to what have been decades of cultural, political, social and economic malaise. However, community-based, co-operative-inclined, non-state funded, and not-for-profit organizations, in whatever form they take (be they cultural or otherwise), are crucial to the development of a common good and a common ground upon which a social and political order can fully emerge in all its potential to actualize real change through forms of disagreement and dialogue. It is precisely that form of social ordering that has been either absent in the region or placed under continued threat, both in a pre- and post-revolutionary setting. What is clear, and all the more notable in the two events outlined above, is that these debates are being not only rehearsed but effectively staged in the public sphere of Tunisian society for the first time in decades, as they are across a region that is still reeling from recent and ongoing uprisings. It is therefore worth asking, before we proceed further, what exactly is meant by civil society in, say, Tunisia or, although we need to maintain contexts, the Maghreb, and how is the term being used here? To answer this question, we must go further into the basis of civil society as it developed and is currently understood. Emerging in the context of seventeenth and eighteenth century, social thought across European civil society ‘represents a critical attempt to argue the moral sources of the social order from within the human word and without recourse to an external or transcendent referent. This challenge and, with it, that of squaring the newly emerging interests of increasingly autonomous individuals with some vision of the public good provided the theoretical and ethical ground for the idea of civil society.' Key to this ideal is the sense of ‘innate mutuality’ and the ‘mutuality of individual recognition’, so that the shared social realm of civil society provides an ‘ethical arena in which the individual is constituted in his individuality through the very act of exchange with others.' The innate mutuality of a given space or realm must allow for dissent and forms of disagreement if the act of exchange required to promote civil society is to garner widespread legitimacy. Base self-interest, egotistical ambition, religious edict, secular determinism, market- and state-led initiatives, all must find a common ground if civil society is to be validated. Amongst the institutions addressed by Hanafi are ones that effectively operationalize the actual concept of civil society. The wielder of power (variously the imam, khalifa, or sultan), for example, was always attended by the‘ulama, those charged with interpreting the intention of the law (shari’a). That this process was open to abuse is undoubted; however, in theory, the ‘ulama wereintended to be independent of political authority and thereafter able to maintain the checks and balances needed to curtail power if necessary. Implied here is the space between the power of the state and the individual as subject needed to effect civil society. To these already potent elements, Hanafi also mentions the diwan al-mazalim, a small claims court of popular appeal, and themazalim court, to which any Muslim can appeal if an injustice has been done to him by a rule or the ruler’s agent. It is notable how the event that ignited the uprisings across the region in December 2010 was arguably caused by the very absence of courts of civil appeal such as the diwan al-mazalim. The event in question involved the actions of Mohamed Bouazizi, an unemployed Tunisian attempting to make ends meet by selling vegetables from a cart, who was subsequently harassed and slapped in the face by a municipal official, had his wares and scales confiscated, and, when denied a fair hearing to air his grievances, committed himself to an unforgiving act of self-immolation. The conflagration that followed has been well documented and its effects are still unfolding across the region. In suggesting that civil society has an ojective and verifiable place in Muslim society today is to note, alongside Hanafi, that the threat to civil society is not related to Islamic definitions of the idea per se, but to the historical moment in which Muslim societies find themselves now. It is precisely the call for reform and pluralism that started the uprisings across the region after, as noted, decades of cultural, political, social and economic ‘malaise’. One further feature of that malaise was the effective subjugation and outlawing of the institutions, cultural or otherwise, associated with civil society. Hanafi observes that the failure of Islamic modernism and secular nationalism, not to mention the ideal of pan-Arabism, has effectively played into the hands of fundamentalism and the forces of conservatism. We could recall here not only Houcine Laabidi’s post-revolutionary call for the death of the artists involved in Printemps des Arts, but also the subsequent death threats directed towards them. To this, we must add that the very debates about the role of religion in public and private life, the will towards secular self-determination, and how human rights and freedom of expression are being developed, are not only being rehearsed in the realm of culture in Tunisia but are being effectively restaged in the antagonistic re-emergence of civil society across the region. Political institutions, to remain healthy, need dissent and disagreement. It is precisely this level of dissent and disagreement that has been traditionally disavowed and repressed across large swathes of the region. Dissent, in the sense that philosophers such as Jacques Rancière uses it, is the political materialization and manifestation of the people. Dissent has to be thereafter policed, structured into, and contained within a symbolic order that is premised upon a given ‘distribution of the sensible’ that, in turn, asserts consensus through prefiguring the conditions of intelligibility, the effectivity of thought, the subjectivization of the political subject and, perhaps crucially, the relationship of the subject to knowledge. In a consensus we all, to put it simply, need to know and abide in our place; if we do not, we can be subjected to proscription or worse. Dissensus also needs to flourish if we are to practice both religious and political freedom. Writing in Silenced: How Apostasy and Blasphemy Codes Are Choking Freedom Worldwide, Paul Marshall and Nina Shea argue that ‘the freedom to debate, to reject, to refuse to respect, to criticize religious ideas, and to worship according to one’s conscience are essential to religious freedom’. Although other freedoms were central to the uprisings that unfolded across the freedom, the freedom to dissent was perhaps crucial to all others. A prohibition against what is and what is not admissable within a given public space is a distribution (policing) of a given sensible and social order. In the events following the closing of Printemps des Arts and those surroundingInside Out: Artocracy in Tunisia, we see forms of policing taking pace that assert control over the private and public sphere. This policing is not to be understood in merely forceful terms or as indeed solely sanctioned by a government or state: the police, if we follow Rancière’s thesis, is an organization of given co-ordinates based upon communal ‘distributions of the sensible’ that, in turn, authorize modalities of being within a given social order. The police (La Police) is better understood as that which communicates the borders between what can be seen, said and heard and that which remains visible or invisible at a given moment in time. In the instances noted above, the given ‘distribution of the sensible’ defines the relationships of individuals to societal and political modes of normativity that are creating fissures between ideological conservatism and the collective will, on behalf of some, towards self-expression. In the wake of the events surrounding Printemps des Arts at the Palais Abdellia in June of this year, Mehdi Mabrouk, the Tunisian Minister for Culture, reportedly said the following: ‘it’s enough for art to be beautiful, it shouldn’t be revolutionary, it should be nice.’ This statement, from a Minister of Culture no less, betrays a simplistic attitude towards art as a practice that borders on foolishness. Nevertheless, it is worth exploring its content further because it also goes to the heart of the matter concerning the politics of culture and its imbrication within civil society. In suggesting that artists, be they revolutionary or not, should steer away from the political realm, Mabrouk is actually making a case for the opposite: in arguing that art has no place in politics he is explicitly politicizing art and bringing it into the political sphere. What could be more political than placing a sanction on an activity within a given social order? If art has no place in the political sphere, as Mabrouk suggests, and should thereafter maintain a quaint indifference to if not aloofness from it, he is attempting to bar art from the political sphere and explicitly highlighting the fact that art is not only already politicized in these debates but is also – consciously or unconsciously – questioning the very boundaries of art and its engagement with social and political issues. Doing art, to paraphrase my epigraph, is to displace and extend the boundaries of art. In this instance, art as a practice, considered a private pursuit with a public dimension, extends into debates around civil society and thereafter displaces its borders of engagement to include discussions around public space and access to such space. If art is indeed increasingly positioned as ‘political’ by virtue of being denied a role in the political realm, it is obvious that it is considered capable of potentially altering opinion, not to mention reconfiguring engagement with various communities. Inherent within Mabrouk’s offhand and imprudent remark is an often occluded but nonetheless potent counter-proposition that alerts us to art’s potential to effect social debate in a country such as Tunisia. If we can argue that politics is reflected in the sum of power relationships that exists in a given sociopolitical order, then any reflection upon that order or broadening of those relations effects a change in the way in which we view and engage with the political. And that, in and of itself, is a political act: to change how people engage, what they see, how they interact, and what they hear (and indeed fear), can only ever be a political gesture. Thereafter we must observe that the very realm if not innate power of the political, for many, is the ability to determine what is and what is not political as such, just as Mabrouk had attempted to do in his proscription of art from the political realm. Any expansion or retraction of the political order, and who has access to it, is an interjection into the syntax and logic of meaning and sense. It is an interjection into the very heart of what it is to think about the political and civil sphere and one’s role in it, not to mention the normative rules of determination to which an individual is subjected within such an order. In the moment of redefining the realm and scope of the political, and the core debate about what constitutes public, private and civil space within that order of the political, new forms of subjecthood, in sum, can be articulated, as can new forms of protest. If a government, be they the relatively pragmatic Ennahda Movement who took over from Ben Ali’s regime, cannot guarantee the freedom of its people to protest and voice dissent in the name of self-expression and self-determination (and hence encourage the sphere of civil society), then what is its function other than the control and the normalization of modes of subjectivity within a political order? Mabrouk, paradoxically and no doubt unintentionally, is making the most explicit case for the fact that art is indeed implicated within a given political, social and civil order, especially if we consider that political order to be a site of dissenting and competing voices. Mabrouk is therefore right to suggest that art should not partake in the political or revolutionary inasmuch as it is obviously represents something that he and the government have no control over and are therefore perfectly within their remit – if they adopt autocratic forms of governance – to be afraid or suspicious of it. So, what role will culture play in the formulation of civil society, not to mention the sphere of the socio-political, in countries where dissent can still result in imprisonment or worse? What place do cultural organizations have in the Middle East when it comes to the broader social, political and historical structure of those environments? The need for supporters of the arts to develop new strategies for supporting the common good, common ground, and communal-based practices of art as an institution have never been more welcomed as they are now in the context of, for example, Tunisia, where civil society – of which artistic practices and institutions are an indelible part – is precisely that which is under threat after what for many must have appeared an interminable hibernation. Art as a practice, by way of a conclusion of sorts, can change how a social order looks at itself and understands its bonds of community or indeed understands differences within that community. I want to return to where we more or less began and end with a quote from Rancière, who proposes that ‘[t]here exists a specific sensory experience – the aesthetic – that holds the promise of both a new world of Art and a new life for individuals and the community’. Artistic practice opens up a horizon of future possibility within which civic imagination can flourish and art as a practice contributes to the forms that civic space takes whilst, in turn, sustaining it through the modalities of engagement. To this end, support for the vectors of possibility and potentiality inherent within cultural practices and the way in which they are already involved in the context of (and support for) civil spaces, dissensus, and debate, is not only needed but remains essential to the success of the political sphere, too. Politics needs culture if it is to reflect and sustain the ambition of its people towards forms of historical self-determination. Politics and culture, therefore, need a common ground for both to be sustained. This is not, finally, about art as a form of political protest (an all too easily co-opted cultural paradigm), nor is this to confuse the artist as protestor (or vice versa). Rather, this is about the potential of art as a practice to open up horizons of possibility for civic imaginations to emerge and be thereafter supported within a community-based network of social relations that includes – but is not precluded either – by the diktats of politics or the edicts of religion. This essay extensively revises an earlier one, which can be found here. ‘For the Common Good’ has been published this month in collaboration between Ibraaz and ZKM: Zentrum für Kunst und Medientechnologie Karlsruhe. Jacques Rancière, ‘The Paradoxes of Political Art’, in Dissensus: On Politics and Aesthetics, ed. and trans. Steve Corcoran (London: Continuum, 2012), 149. The question of how blasphemy and the accusation of apostasy is stifling and delegitimizing critical and political debate across the Muslim world has been examined by Paul Marshall and Nina Shea in their comprehensive volume, Silenced: How Apostasy and Blasphemy Codes Are Choking Freedom Worldwide(Oxford: Oxford University Press, 2011). Marshall and Shea argue that the accusations of ‘blasphemy’, ‘apostasy’, or ‘insulting Islam’ are deployed with increasing regularity and results by both authoritarian governments and extremist forces in the Muslim world to stifle debate and consolidate power. Interestingly, they argue, this is not just aimed at internal opposition groups and religious minorities but external events, such as the furore in 2005 over the cartoons, drawn by Danish national Kurt Westergaard, satirizing Islamic terrorism. As I was writing this, news broke of the assassination of the Tunisian opposition politician Chokri Belaid, who was shot dead outside his home in Tunis on the 6th February 2013. Whilst this does not necessarily augur a return to despotism, it does not bode well for the freedom of speech in Tunisia. See: ‘Home Workspace: A Conversation between Christine Tohme and Anthony Downey,’ Ibraaz, 2 May 2012 www.ibraaz.org/interviews/24. Omar Berrada, the director of the library and translation centre at Dar , suggests that, ‘the questions of public space and of civil society have been with us since the beginning, as we were trying to avoid creating a mere retreat for artists, a luxurious ivory tower for intellectuals in the middle of nowhere – precisely because the countryside is not ‘nowhere’ ‘. His response was part of a larger survey of institutional contexts and the role of art in the development of civil society across the region. The survey was carried out by Ibraaz and all responses can be read at: http://www.ibraaz.org/platforms/3. RUYA is officially registered by the Iraq Commission for Civil Society Enterprises, and its mission statement in full reads: ‘The foundation’s [RYUA’s] initial goal is to promote culture in Iraq at a time when priorities are focused elsewhere, and to build a platform that will enable Iraqis in the arts, the young in particular, to benefit from, and participate in international events. In addition to supporting local projects, its aim is to create a network of intercultural events that can contribute to the development of civil society in Iraq. It is also committed to nurturing a multicultural dialogue through the arts.’ See: http://ruyafoundation.org/mission/. I borrow this notion of malaise from: Samir Kassir, Being Arab (London: Verso, 2006). It is all the more crucial here that I offer, however provisionally, a degree of distinction between so-called Non-Governmental-Organizations (NGOs) and the institutions of civil society, especially as both can become confused and NGOs offer much by way of support for cultural activities. NGOs also contribute to the stabilization of civil society in post-conflict countries, but civil society itself cannot entirely rely upon NGOs to further expand the realm of the civic. Whilst this is not necessarily the best place to go into these debates, it is notable that the majority of NGOs began as humanitarian vehicles in the area of economic development, but have quickly extended into social and political spheres. This has given rise to a series of criticisms when it comes to examining how such organizations can effect neo-colonial cultural and political agendas and become conduits for the international regulatory systems of global capitalism. For a fuller discussion of these issues, see: Tina Wallace, ‘NGO Dilemmas: Trojan Horses for Global Neoliberalism,’ Socialist Register 40 (2004) 202-219. Adam B. Seligman, ‘Civil Society as Idea and Ideal,’ in Alternative Conceptions of Civil Society, eds. Simon Chambers and Will Kymlicka (Princeton: Princeton University Press, 15). Hanan Hanafi, ‘Alternative Conceptions of Civil Society: A Reflective Islamic Approach,’ in Alternative Conceptions of Civil Society, eds. Simon Chambers and Will Kymlicka (Princeton: Princeton University Press, 171-189). Hanan Hanafi, op cit., 174. Hanafi lists a further series of subsidiary institutions which are intended to bridge the executive power of the imam and the judicial authority of the ‘ulama, including the concept of hisha, which protects the individual against monopolization in market places and usury. Other insitutions, including awqaf, a form of religious endowment to scientific, literary and academic foundations, allows individuals to endow scholarships, schools, publications and universities without government interference. I have written elsewhere on this event, in ‘Beyond the Former Middle East: Aesthetics, Civil Society, and the Politics of Representation,’ Ibraaz, 1 June 2011 http://www.ibraaz.org/essays/8. When Islamic movements were delegitmized as component elements of civil society, in the wake of secular, nationalist state formation, they turned their attentions to mass media, labour unions, professional associations, and NGOs. ‘Elements that are not allowed to compete for popular support within civil society will inevitably become as averse to the values of civil society as those who suppress them. It is hardly surprising therefore that fundamentalist groups employ the traditional accusation of anathema, false innovation, and heresy against artists, thinkers, writers, professors …’ See: Hanafi, op cit., 186-187. The aftermath of this affair in Tunisia has had further repercussions that are still subject to scutiny and debate. In a letter dated 13 September 2012, Hurman Rights Watch addressed members of the Tunisian National Constituent Assembly who had just released a draft constitution made public by the National Constituent Assembly on 8 August 2012. In the letter, the authors noted that although the draft Constitution upheld ‘many key civil, political, social, economic and cultural rights’, including ‘freedom of movement; freedom to assemble and associate’, the articles contained therein also undermined basic human rights, including ‘freedom of expression, women’s rights, the principle of non-discrimination and freedom of thought and conscience.’ On the explicit subject of freedom of expression, the letter argued that Article 26 of the draft constitution provides that freedom of opinion, expression, information and creation is guaranteed and can be limited only be laws designed to protect the rights of others, their reputation, security and health. However, draft article 3 threatens freedom of expression by stipulating that ‘The State guarantees freedom of belief and religious practice and criminalizes all attacks on the sacred.’ This provision, which defines neither what is ‘sacred’ nor what constitutes an ‘attack’ on it, opens the door to laws that criminalize speech.’ These concerns have very real and verifiable effects in a country where social and civic space – within which culture thrives – has become an increasingly charged venue for protest and community-based forms of self-organization. Paul Marshall and Nina Shea, Silenced: How Apostasy and Blasphemy Codes Are Choking Freedom Worldwide (New York: Oxford University Press USA, 2011), 5. The political subject for Rancière challenges the ‘symbolic structuration’ of the community that abolished dissensus in the first place and is thereafter engaged in a process of non-identification with the distribution of the sensible in which he or she finds themselves. Subsequently, non-identification with a given order becomes a moment of instantiating political subjectivity as it introduces dissensus, the latter a disagreement with the established framework of perception/distribution of the sensible that effectively ushers in, as opposed to consensus, politics proper. Rancière writes: ‘Through the process of subjectivization, political subjects [le Sujet politique] bring politics proper into existence and confront the police order with the heterology of emancipation.’ Jacques Rancière, The Politics of Aesthetics (London: Continuum, 2004). 90. Jacques Rancière, ‘The Aesthetic Revolution and its Outcomes: Emplotments of Autonomy and Heteronomy’, in New Left Review (March/April 2002), pp.133-151 (p.133). Downey, Anthony. “For the Common Good Artistic Practices, Collective Action and Civil Society in Tunisia.” Ibraaz. Ibraaz, 28 Feb. 2013.